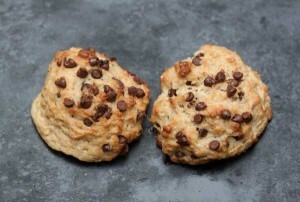 Vegan Chocolate Chip Scones are made with a mixture of coconut oil, applesauce and tofu. I measure most ingredient by weight, so if you have a scale I recommend using that. Preheat oven to 400 degrees F. and line a large baking sheet with a Silpat or some parchment paper. Combine the flour, baking powder, brown sugar, sugar and salt. Add coconut oil and mix with a spoon or heavy duty scraper until mixer is coarse. You may also do this in the food processor bowl if you prefer and then dump it into the mixing bowl. Pat the tofu dry, weigh out 4 ounces, then put tofu, applesauce and vanilla to the food processor and process until smooth. Scrape the tofu mixture into the flour mixture and to form a soft dough. Stir in chocolate chips. Drop 6 equal size mounds of dough onto the baking sheet. Bake at 400 for 18 to or until lightly browned. Let scones cool for about 15 minutes before serving (texture improves slightly as they cool). **I like to drain some of the moisture out of the applesauce before measuring. Less water means more apple p and potentially less water to contribute to steamy rubberiness. To drain, just spoon about 4 tablespoons of applesauce onto a stack of paper towels and let the towels soak up moisture. Measure your 2 tablespoons of applesauce by scraping it up off the towels. In my opinion, Rumford baking powder is the best brand to use. Some brands leave a slightly metallic flavor behind, but Rumford tastes a little cleaner.